Australia Day +++ Can-do attitude +++ The lucky country +++ Absolutely Intercultural 235 – absolutely intercultural! Let us see whether in Queensland being Australian is also about football, meat pies, and BBQs. I asked some colleagues from the University of the Sunshine Coast how they were planning to celebrate Australia Day. Bishnu told us that when he first moved to Australia he did not really like eating lamb but now it has turned into his favourite dish. Talk about successful integration! I am following up this topic of the first keepers of the land and asked how the attitudes of the majority of Australians towards Aborigines and Torres Strait Islanders have changed over the years in society and in education. Every year the Australian of the Year is elected and this person will give important public speeches during that year. In 2014 I was fortunate enough to be able to listen to the speech of the outgoing Australian of the Year talking about attitudes to indigineous people and to multiculturalism in general. You could really see on Ita Buttrose’s face how happy she is that her ancestors came over to Australia in the 1850ies. 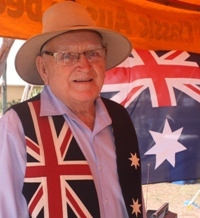 On 26 January 2014, I visited Australia Day in Noosa, Queensland, in search of examples and explanations of the”can-do” attitude, the “fair go” and the “Lucky Country”. I did not have to search long because the first person I met, John Major, “Bush Poet” and former farmer, explained to me in his own words what these Australian concepts are all about for him. Unfortunately, John passed away in 2017 – all the more reason to commemorate him here on the podcast. Our next show will be coming to you on March 1 from Anne Fox in Denmark.